When you think of Bosch tools, do you think of drills and planers and routers? I know I did. 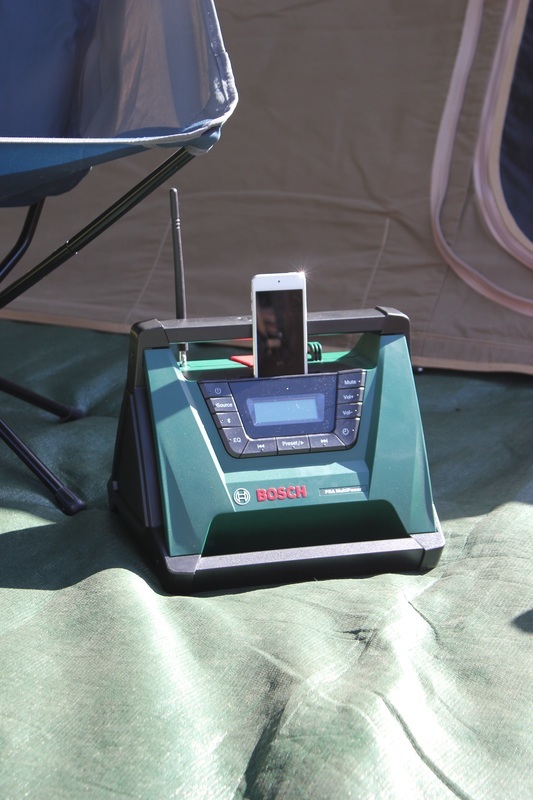 How could Bosch tools help you with camping? Did they even make something that could come on your camping trips? I was a little on the skeptical side when I heard they were sending me something. How was I going to review a circular saw for camping use? Thankfully, Bosch seems to know my capabilities, and didn’t send me an angle grinder. 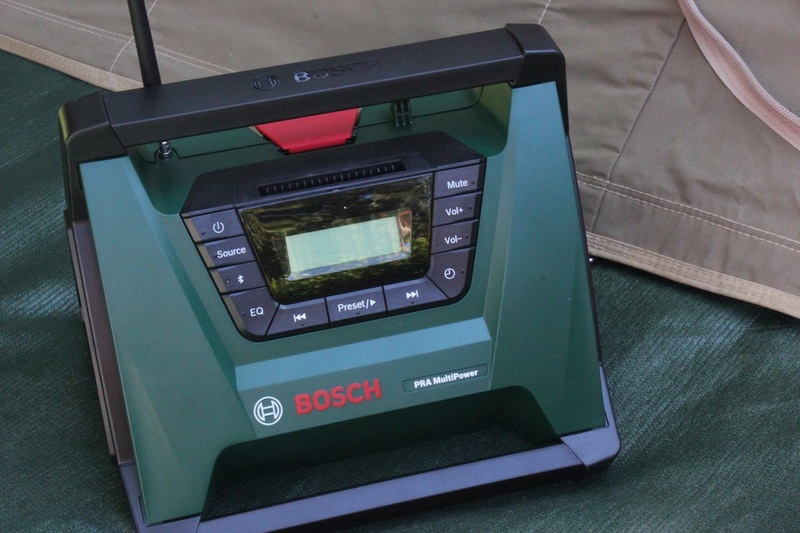 What I did get to review were actual Bosch products I knew how to use and products that I could actually take camping. So what were they and how could you use them on your camping trip? 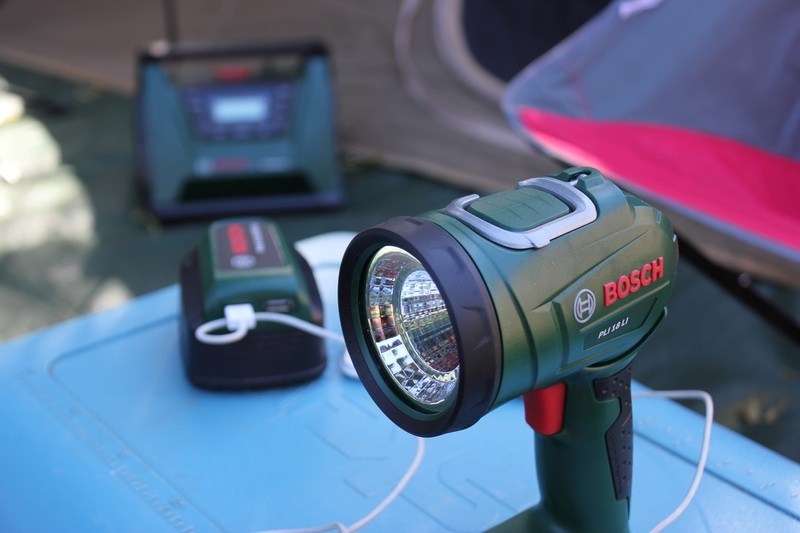 See what we thought of a variety of Bosch products, entitled the Ultimate Camping Kit on our camping trip. 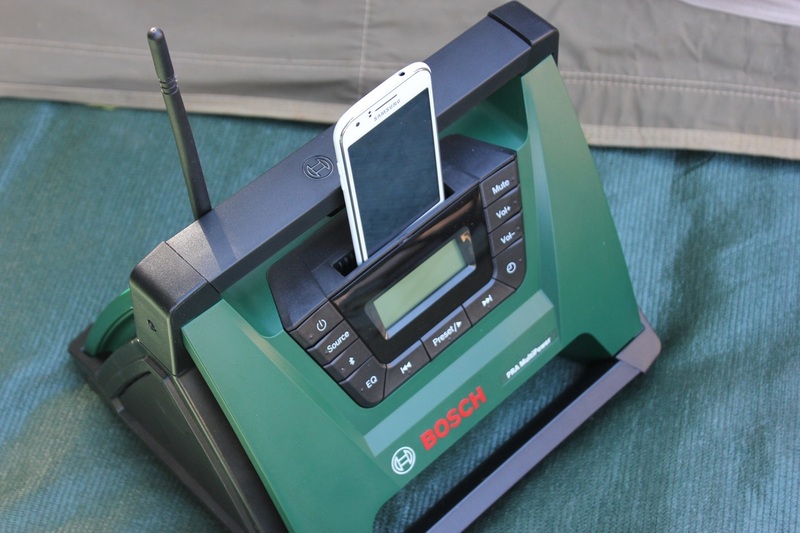 The first Bosch product to be used was the USB Powerbank Adapter which for us, is incredibly useful. Because it charges our mobile phones plus our children’s devices. Now, purists may say, you don’t need your devices when camping, but we use our phones as cameras as well, as GPS devices, so having them charged is important. Plus sometimes, around the campsite, playing a game on the phone is a great way to chill out. Naturally, with all technology, moderation is the key. This adapter needs to be attached to Bosch Battery – which is the weighty part of the package. For us, who sometimes takes our Thumper 12V into the tent to charge some devices, this was a whole lot easier to take inside the tent; just a battery with an USB adapter. A lot lighter, and takes up less room. With 2 USB ports the adapter allows two people to charge up at the same time. We were able to fully charge 2 phones with the adapter, but up to 6 phones can be done apparently (we didn’t put that to the test). Relaxing around the campsite, can mean playing a bit of music. We are mindful of those around us, and don’t blast them with our choice of music (which can be one of the most annoying things when you camp next to people who insist on sharing their dubious taste in music with you). For this trip, we got to use the PRA Multipower Radio. This is a radio with integrated speakers, which has standard ability to preset AM and FM stations, but what we love the most was the ability for it to connect via Bluetooth to our phones (thankfully charged already via the Powerbank Adapter), and play the music we want to hear! 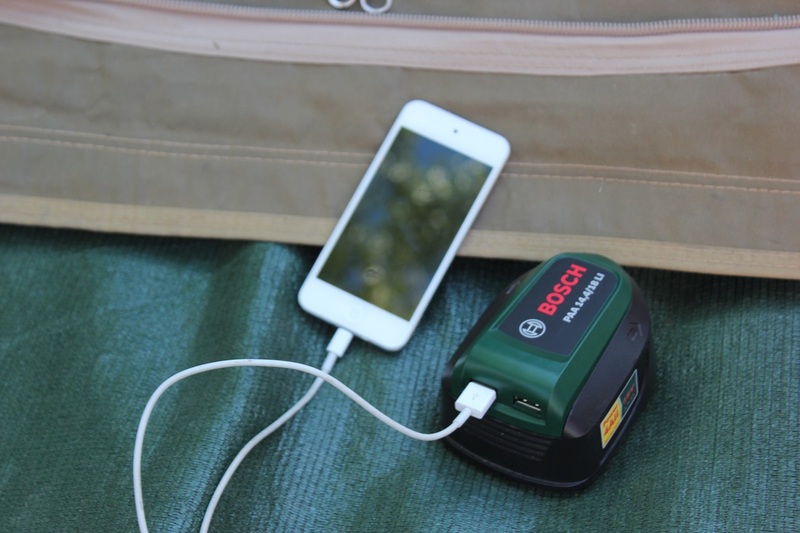 At home or at a powered campsite, you can power it via a standard 240V, or you use the battery pack once again to power. This radio is a bit on the bulky side for us and our camping style. We really seem to struggle to fit in everything in our car, so this radio was probably too big for us when we travel. I can see that for others, it may not be such an issue. We are more likely to use it when we are at home, entertaining outdoors. I also can see those who work outside, carrying it with them to a work location. 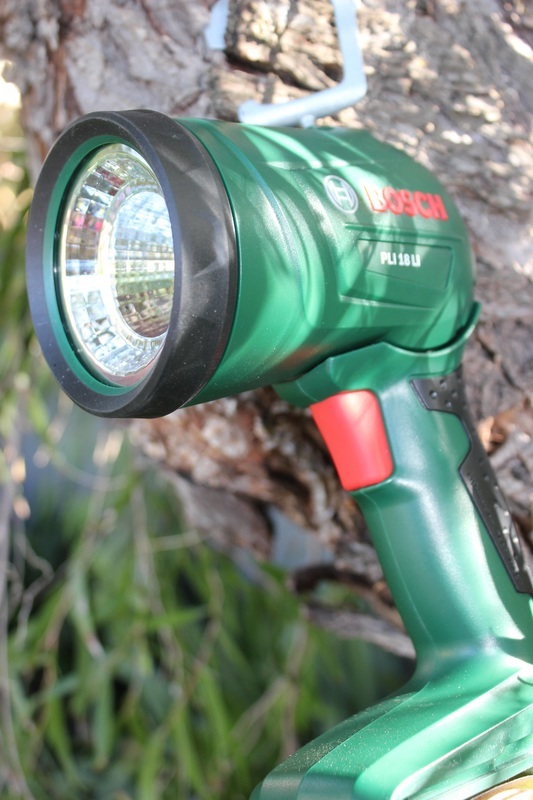 The battery also was put to use again with the cordless light – the Bosch PLI 18LI torch. Now, regular readers will know that I love lights around the campsite and can’t have enough, so I was pretty happy to have another light to add to the camping gear. 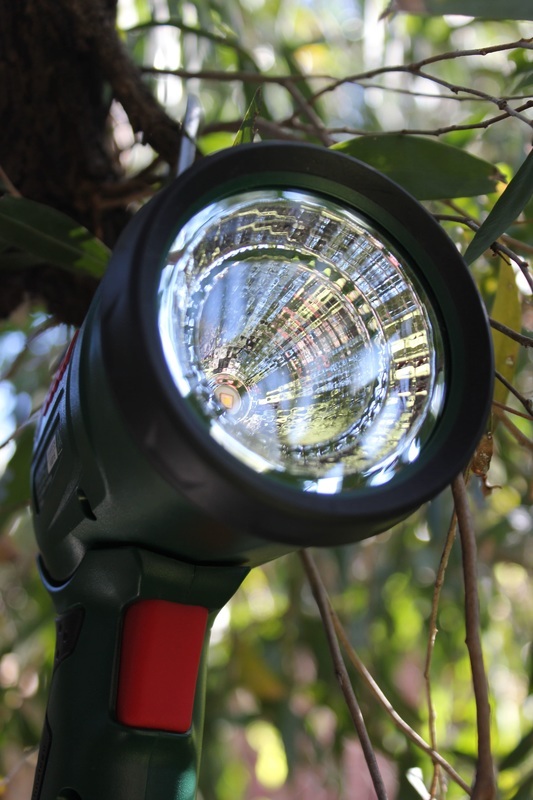 With a good beam and ability to pivot the head up and down, to direct the light, the beam at 3W LED (about the same as a 45W incandescent light), is handy around the campsite, and walking around at night (or great for home). It does need the battery attached to it, which does increase weight. There is a hook to hang the light from the tree, but that is a bit on the flimsy side so I did worry about the hook supporting that weight. The large button to turn it on/off also allows you to have two different light modes, though the difference between the two was minimal. I wouldn’t be flicking between the two modes as couldn’t see any advantage in doing so. At the end of the trip, we packed up our Ultimate Camping Kit from Bosch, but there was one more item of this kit which wasn’t brought along with us…….we left it at home. Because there was no way we could fit it in the car on this trip. It was the High Pressure Washer – designed for a variety of cleaning purposes, like washing up your camping vehicle and around the house. If you had a caravan, then this High Pressure Washer with all the necessary cleaning equipment stored on it, would be a perfect tool for cleaning up after a trip. With lots of accessories, all easily stored on the washer itself, it packs up quite easily and doesn’t take up too much room in the garage. Faster, and more water efficient, your cleaning of your camping vehicle after a road trip, just got a whole lot easier. For us, cleaning up around the outside of the house is a big benefit of this product and we used it to clean our gutters (true, that is not a camping sort of thing, but it shot down all the gunk in the gutters, at high pressure). We couldn’t use it for camping, but I see the benefits of having such a product, especially if your car is looks a bit worse for wear after being on dirt roads. Bosch has made a variety of products that are suited to being at home or in the workshop, but they aren’t just limited to those two environments. They can be adapted for use for those who like to go camping, but what you take depends on your camping style (and the room you have to take with you). The collection of products was called the Ultimate Camping Kit, and I am not so sure it's best described as ultimate as that conjures up images of sleeping bags, beds and tents. This gear is better described as handy additions to your standard camping gear. We personally found the torch to be a useful addition to our supplies (as long as we bring along the fully charged battery), as its an easy grip torch that can be readily used by everyone, and I will use it at home as well - it's currently proving handy finding some lost items in the garage! 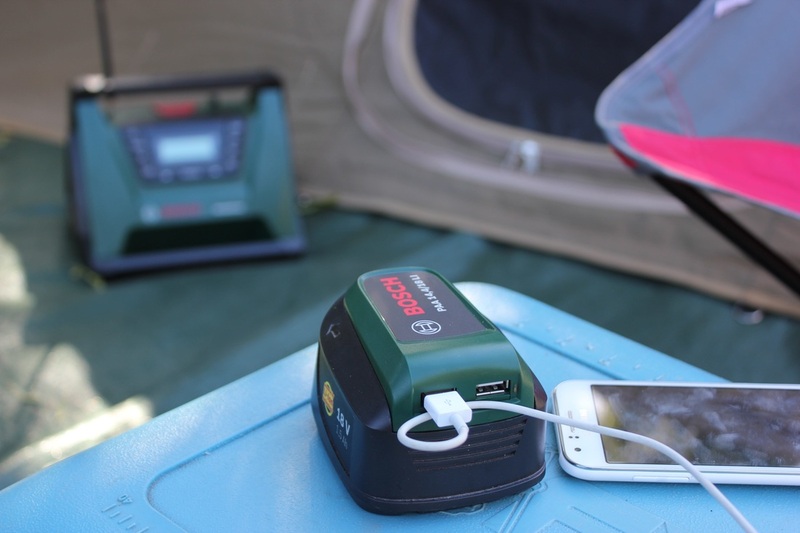 The USB Powerbank made charging of our phones easy and a lot less weight than taking our Thumper 12V battery into the tent for that purpose. Of course, you need the battery attached, so with only 1 battery to play with, you do have to choose what Bosch product is going to be used eg. no torch in the tent if we are charging our devices and vice versa. I do believe that the purchase of the starter pack will provide more than 1 battery, but we only had the one! 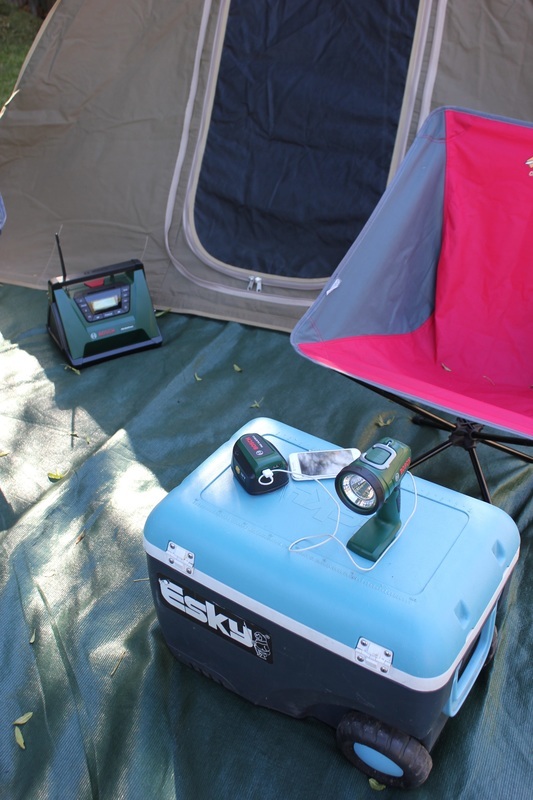 The radio and high pressure water unit are perfectly functional and perform well, but we wouldn’t classify them as items for camping. They really are products that campers can do without when camping but to use around the home as they are much more suited. Our outdoor furniture and concrete on the verandah will be a whole lot cleaner in the future thanks to the washer. The battery was charged very quickly at home, on the recharger. 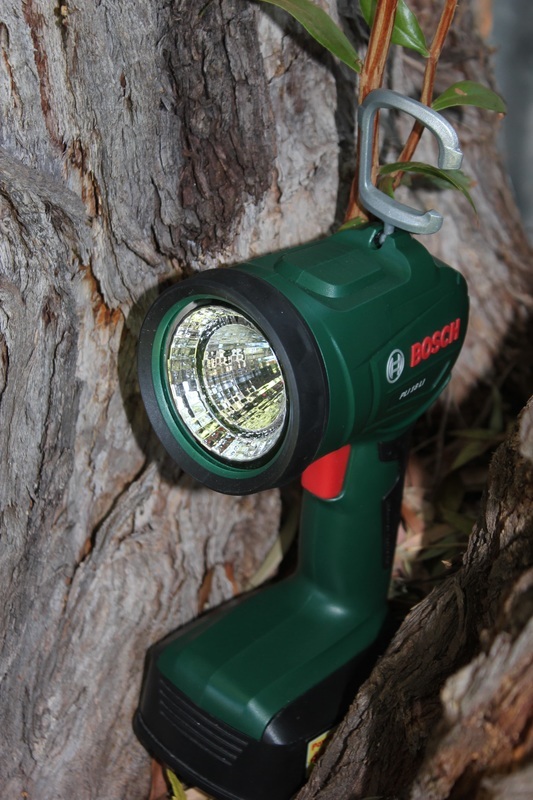 The range of Bosch tools utilizes this battery, so the initial outlay for the battery will be worthwhile if you own a range of cordless tools by Bosch. All of these products are generally available at any hardware store that stocks quality products. Or alternatively see the website below for further information. Prices of the above products at time of writing are as follows. 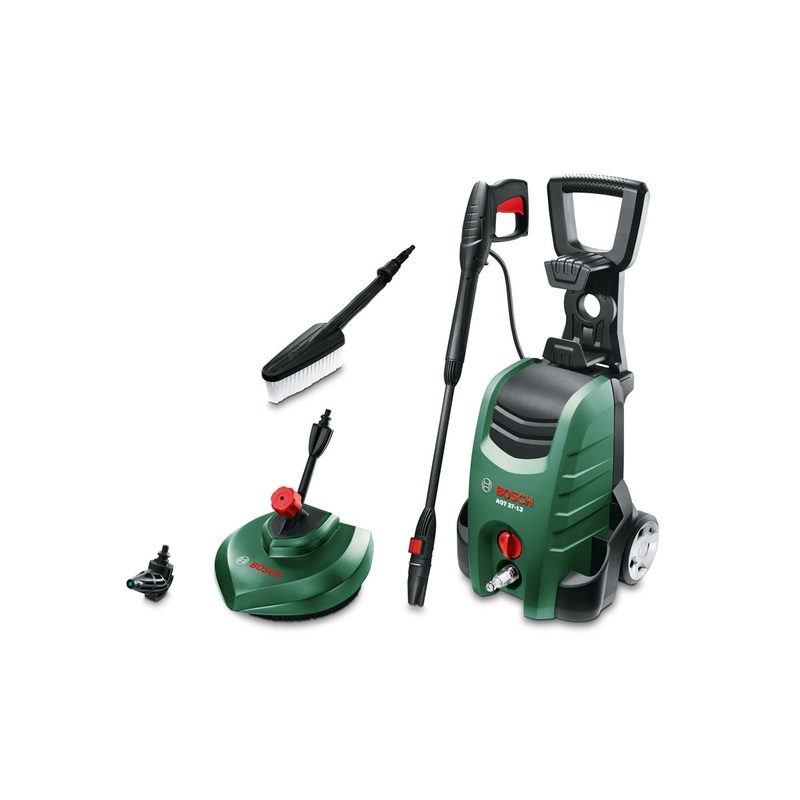 For more information on Bosch Australia, please visit their website. The above items were gifted to Go Camping Australia for the purpose of this review. To find out more about our review process, please read here.